Thanks to everyone who voted for him, sweet Rocket will hit the open road on July 30! Donna, Rocket, and I are not sure where this year's trip will take us. Maybe we will drive north. Maybe we will head south. Perhaps we will go north and then south. Not having a clear plan or path makes the trip even more fun and exciting. We hope you will follow our adventures here and over at Let's Go Somewhere on 7/30! Would you like one of the Rocket dolls featured in the video at the top of this post? Yes? Well, I'm giving away one doll right now. 1. It will run from 7/20 to 11:59 p.m. on 7/21. Very cool! 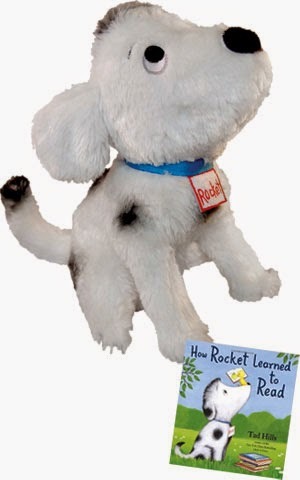 I can't wait to see what adventures Rocket Dog gets up to.